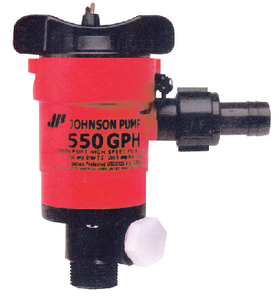 Dual port pumps offer the convenience of a single intake for both livewell and raw water washdown operation. Connects directly to a seacock and the upper outlet connects to a 3/4″ livewell hose and the lower outlet connects to a washdown pump through a 1/2″ or 3/4″ port. High pressure inlet seal handles higher pressures. Duraport discharge port eliminates stress cracking on fittings. Made in USA.